The auxiliary davit of series ŻOWJe, with electric drive for slewing gear and for rope winch, can be ope­rated at rated hoisting capacity under conditions of vessel's heel to 5° to either side and simultaneous trim up to 5°. 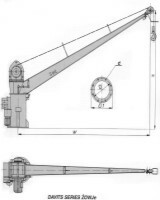 The davits are made in the left-hand or right-hand variation, depending on the side from which the slewing gear is driven by means of the crank handle if in emergency. Rated hoisting capacities Q of the davits are as follows: 0,25; 0,63; 1,0; 1,6; 2,0; 2,5; 3,2 and 4,0 t.
Outreach values W in standard execution of davits are equal to: 1,0; 1,5; 2,0; 2,5; 3,0; 3,5; 4,0; 4,5; 5,0; , 5,5 and 6m. Heights of davits H above the deck amount: 1,75; 2,25; 2,75; 3,25 and 3,75 m.
Davits are equipped with electrically driven rope winch type WZP of "SEZAMOR sp. z o.o." make. Capacity of rope drum to 45 m of rope and allows for hoisting of cargo with speed about 10 m/min. onto height of about 45 m.
Slewing of davits is realised by means of mechanic transmission gear driven with electric motor. In emergency the davit may be slewed also with the crank handle. 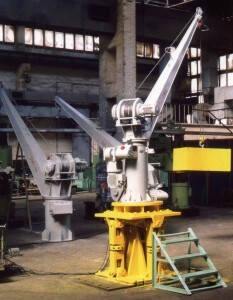 Slewing angle of davit is within range -180° to +180° with regard to the normal stowage position of davit. Slewing duration by an angle of 90° with electric drive equals appropriately: 15 sec. for mean duty modification, 20 sec. for heavy duty and 24 sec. for very heavy duty modification.